A pet reticulated python near the Schuylkill River in Philadelphia. A Vineland man who survived a life-threatening bite from a cobra last September was fined $5,000 on Thursday for keeping more than a dozen snakes in his South Jersey home. Allan Carlson, 54, pleaded guilty Thursday to 15 counts of possession of a live, potentially dangerous, exotic animal, according to the Vineland Daily Journal. Charges of possession of an exotic wildlife without a permit were dismissed. Carlson showed up at Inspire Medical Center in Vineland last September with a dangerous snake bite. On his drive to the medical center, the man's vision reportedly failed. Carlson’s mother took over driving, according to the Daily Journal, and he later passed out in the hospital parking lot. Police later found 16 snakes inside his Vineland residence, according to the Daily Journal. 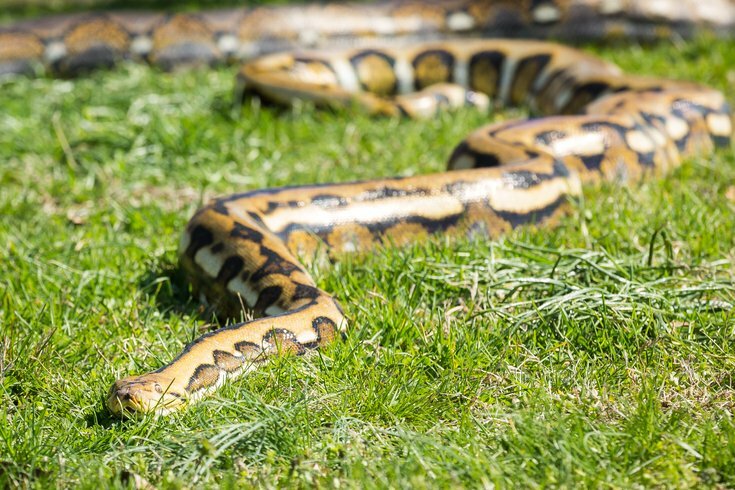 Wildlife officials recovered two reticulated pythons, one of which was more than 10 feet long, and a forest cobra. Officials believe the forest cobra had bitten Carlson. Carlson isn't new to odd news: According to NJ.com, he previously served time in prison for harassing the staffs Philadelphia-area newspapers including the Inquirer, and was also arrested in 1993 for white supremacist vandalism in California. In 1993, Carlson stamped the phrase "earth's most endangered species: the white race, help preserve it" in notebooks in a California supermarket, according to New Jersey officials. In 2005, while still living in California, Carlson hacked email addresses of journalists at the Inquirer and Daily News to email complaints about the Phillies. Officials also reportedly found containers of tarantulas and other bugs throughout Carlson’s home. All but one of the 16 snakes officials found in September were transferred to the Cape May Zoo, the Daily Journal reported, and were eventually sent to a research facility in Kentucky.